Travelling in comfort and style goes far beyond the hotel that you’ve booked. In fact, ensuring that your holiday is fuss-free and fashionable starts right back at your home, when you decide upon your luggage. While it may not seem like a big deal initially, choosing the bags and suitcase to take with you on a journey has an effect on your whole time abroad or away. From how you present yourself on a business trip with the boss to how easily you can navigate your way through a busy airport, your choice will have an impact. So, to ensure that you get the best out of your trip before you even leave home, just follow this ultimate luggage guide for travelling. The wash bag, which is also known as a toiletries bag or Dopp kit, is an essential piece to your set of travel bags. Whether you’re heading for an overnight getaway with your girlfriend or on a month-long trip to Europe, you’re going to need a wash bag. It also must be good quality. After all, you don’t want to arrive at your destination only to find that your cologne or shaving cream has accidentally leaked right through your toiletries bag and all over your clothes. To select a durable and functional wash bag that also appears stylish, forget cheap polyester and polyurethane options and stick to leather and quality material designs instead. Doing so will ensure that it performs at its best no matter where you travel or for how long. Although many men may view a garment holder as unnecessary, it’s actually an incredibly handy bag to own. Particularly useful for business travellers, a garment holder is intended for items that you’d typically hang instead of fold. As such, they’re ideal for workwear and formal pieces, such as suits, which you don’t want to get creased and wrinkled in your suitcase. So, by investing in a good soft-sided garment bag, you’ll never have to show up to another meeting, conference or wedding looking sloppy again, no matter how late your flight gets in. Don’t forget about your shoes either. Like a garment bag, a shoe bag will keep your polished footwear looking perfect for the main event. If you’re planning a quick getaway or speedy business trip, a weekender bag is an ideal option. The handy bag, which typically comes in the form of a duffel or hold-all, is convenient to tote around and can fit everything you need for a 48-hour period or more. It can also easily be carried onto your flight, meaning that there’s no need for any annoying and expensive check-in luggage. To get the most out of your weekender bag, choose one in either leather or a high-quality and durable material. While a leather option will provide a sleek and stylish appearance, a more flexible fabrication, such as nylon or canvas, will allow you to fit in all those extras that you forgot you wanted to pack. If you’re after a carry-on that’ll see you through short trips with style and functionality, a cabin case can make an excellent option. These small and handy suitcases are just the right size to safely carry and store all the belongings you need for a few days away from home. They’re also the perfect option for maximising the carry-on size specifications of airlines without accidentally going over, provided that you buy with the measurements in mind. To make your cabin case even more practical, choose one with four spinner wheels. Doing so will allow you to effortlessly glide through airports instead of lugging around a heavy weekender bag or battling less manoeuvrable two-wheel options. When it comes to travel bags, the suitcase is the main attraction. While other items, such as a wash bag and weekender, are still necessary, the suitcase is the linchpin of luggage. As such, it’s an important purchase to get right. Skimp on quality or don’t do enough research and your suitcase could end up breaking or bursting open before it even reaches its destination. But, if you know what you need and are willing to spend a little to get it, your suitcase could easily last a lifetime. From your trek home during the holidays to your tropical honeymoon, the right suitcase will be there for all your important trips, so be sure to buy with quality, durability, and style all in mind. A surefire way to choose top luggage that will last is to buy it from one of the best brands available. While the world of luggage brands is vast and plentiful, there are a few names that stand out from the rest. Labels, such as Samsonite, Rimowa, Delsey, Lipault, Kipling, Bric’s, Briggs & Riley, and Victorinox offer incredible quality, durability, functionality, and style across all their bags and cases. Whether relatively new or over a hundred years old, these brands also tend to be at the forefront of industry innovation, offering the best new materials, designs, and services available. While buying a suitcase from one of these labels will naturally cost more than picking up a cheap option, it will be worth it in every way imaginable, including longevity, fashionability, and practicality. Invest in a quality leather wash bag with interior lining to keep toiletries from accidentally spilling into your luggage. Use a garment holder when packing a suit or other typically hung items to prevent them wrinkling and creasing during your voyage. If you’re going away overnight or for a couple of days, choose a weekender bag to hold all your belongings in style. Select a cabin case to maximise your carry-on luggage for short trips away. 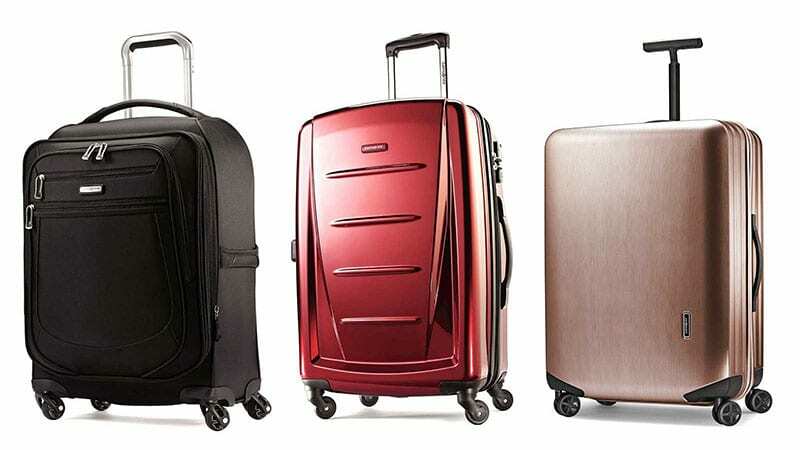 Choosing a suitcase with four spinner wheels will help you easily navigate busy airports and avoid arm strain. Buy quality luggage from a top brand to ensure that it protects your belongings and lasts a lifetime.